Last Updated: March 19, 2019 · Published: October 4, 2016 By: Asian Caucasian 1 Comment This post may contain affiliate links or sponsored content. Skip breakfast? Never! 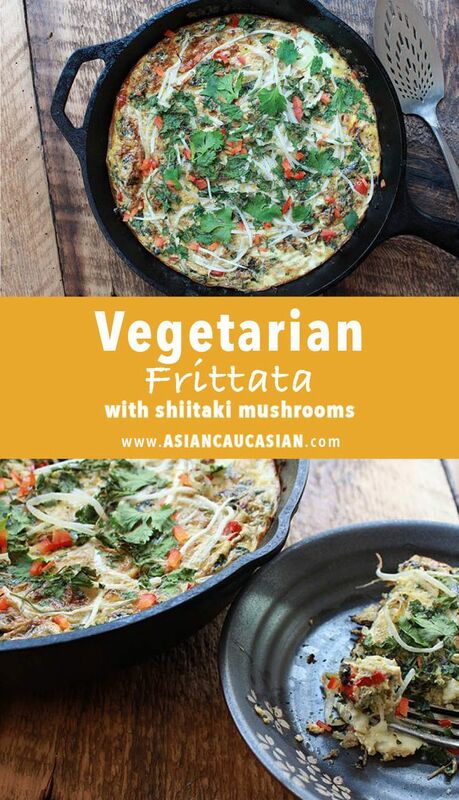 Wait until you try this simple Asian-inspired Vegetarian Frittata with Shiitake Mushrooms that you can eat for breakfast, lunch or dinner! I love eggs, (probably eat too many of them!) and this dish is loaded with healthy veggies like shiitake mushrooms, bell peppers, and kale. You can throw in whatever veggies are in your fridge, and even some protein. That’s why I love making frittatas. Everything but the kitchen sink – Voilà! 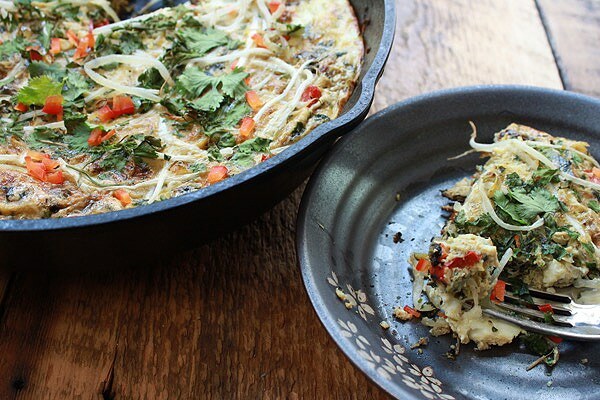 This Asian-inspired Vegetarian Frittata with Shiitake Mushrooms is loaded with healthy veggies like shiitake mushrooms, bell peppers, and kale! In a large cast iron skillet over medium-high heat, heat the oil (make sure to coat the sides of the pan with the oil). Add the shallots, green onions, ginger, and garlic and sauté for 1 to 2 minutes until translucent. Add the red bell pepper, Thai chili pepper, kale, and shiitake mushrooms, and sauté for 3 to 4 more minutes until just done. Meanwhile, in a medium bowl, whisk together the eggs and the soy sauce (do not over mix!). Add to the skillet on top of the vegetables. Cook over medium heat for 8 to 10 minutes until the edges start to set around the sides of the skillet, about 5-7 minutes. Remove from stove and place the bean sprouts over the eggs. Sprinkle with fresh cilantro. Place skillet in the oven and bake just until top is set, about 10 to 12 minutes. Set oven to broil. Broil the frittata for 30 seconds just to brown the top. Cut into wedges garnished with cilantro when ready to serve. 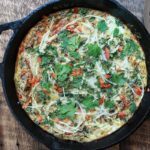 This was the tastiest frittata I’ve ever had! Absolutely delicious, and not difficult to make.